My brother is studying Religion at Copenhagen University and once he had brought some of his books from his studies when he visited us. 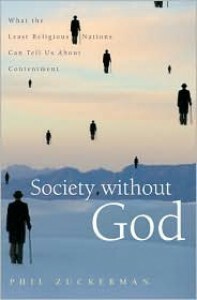 Society without God was one of them. I was caught by the title and the blurb. The book is a social study from an American's point of view of the Swedish and (mostly) the Danish need of religion - or lack of the same. Being a Dane and being a atheist I got curious and looked a bit in it. This book is not hard to read and understand! It is very simple written without any hard terms. I do although have ambivalent feelings about that. Not so much the lack of terms but Zuckerman's argumentation annoys me. First of all, being a scientific book as it is, it annoys me how many non-relevant anecdotes Zuckerman mention's. I mean, for good sake! I do not care how your trip with the bus went! You may have come up with some philosophic questions while having the trip, but does the trip have to be described in any little detail! Second of all, his research is based some statics (will not blame those) and on 150 1-2 hour long interviews with people he knew and people who knew those he knew. 30-and-something were Swedes, the rest (120!) were Danish. I know Denmark and Sweden are not big countries (Denmark 5,4 million, Sweden 9 million), but still! That is not enough to apply the same standards to all! Especially not the Swedes! I am just saying. Third of all, Zuckerman's argumentation is generally... vague. No other words need to be described. So that is my scientific opinion of this book. That said, I did find the book interesting reading. It did start some thoughts in my head, because his experiences with Danes believes are not quite the same as my experiences. In the book there are some excerpts from some of his interviews and I started to imagine what I would answer. So I have been philosophizing for a while and I do like it when I can't stop thinking about a book. But still sometime Zuckermans conclusions annoyed me. Again I must say I am ambivalent with this book. What do you do? You give it a middle rating!